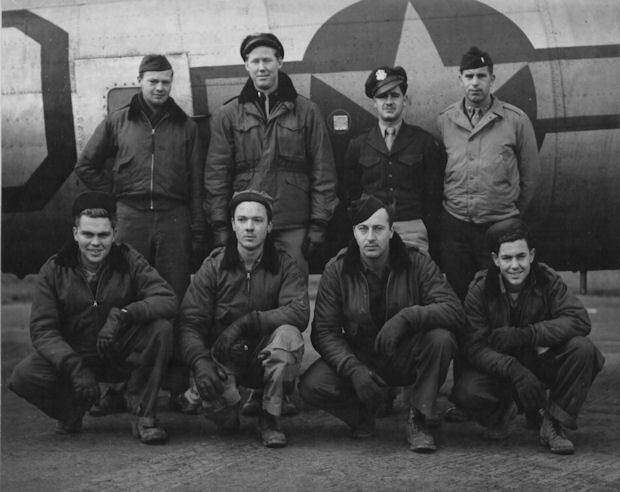 T/Sgt Charles F. Carlson (E) - still on B-17 not in photo. 314 (15 Feb 1945), 317, 318, 319, 320, 324, 336, 338, 339, 340, 342, 343, 344, 347, 350 (SR), 351, 352, 353, 357, 358, 359, 360, 362, 363 (20 April 1945). (SR) Non-Credited Spare B-17 that returned to Molesworth after take-off and formation assembly. For Mission dates, targets and Mission Reports, see Combat Missions. 2Lt Morton C. Perkins (P) - First mission (315) flown with combat Orientation CoPilot 2Lt Richard L. Elkins. Two missions flown as CoPilot (358, 359) with regular crew CoPilot, 2Lt Kamstra flying in the left cockpit seat as Pilot. All other missions flown as First Pilot. Completed 23 credited combat missions on 20 April 1945 (Mission 363). 2Lt Walter W. Kamstra (CP) - Flew on 19 missions with the 2Lt Perkins Crew (All missions except 315, 360, 362, 363) and one mission with another Pilot (315) Two of these missions were flown as the left seat Pilot with 2Lt Perkins as right seat CoPilot (358, 359) after 2Lt Kamstra had been upgraded from CoPilot to Pilot on orders dated 3 April 1945. He then flew on three additional missions as a First Pilot with other crews (360, 362, 363). Completed 23 credited combat missions on 20 April 1945 (Mission 363). 2Lt Robert J. Wallace (N) - Flew on 13 credited missions with 2Lt Perkins crew (2Lt Perkins missions 315 through 344) and one missions as a Lead Crew Mickey Navigator (348). Completed 14 credited combat missions on 30 March 1945 (Mission 348) when his B-17, piloted by Captain Hugh B. Johnson, was shot down on a mission to Bremen, Germany and the entire crew became POWs. Sgt Arlan R. Allen (Tog), S/Sgt Charles E. Carlson (E), S/Sgt Gerald G. Little (R) - Sgt Walter G. Beckwith (BTG), Sgt John T. McDonald (TG). Flew on all of the 23 credited 2Lt Perkins missions with the following exception: S/Sgt Little - stood down on mission 362. Flew on mission 364 with another Pilot All completed 23 credited combat missions on 20 April 1945 (Mission 363). Sgt Warren L. Partsch (WG) - Flew on 10 credited missions with the 2Lt Perkins crew (315, 317, 318, 319, 320, 324, 336, 342, 344) and two missions with other Pilot (316, 343). Completed 11 credited combat missions on 23 March 1945 (Mission 344). 2Lt Perkins flew with an eight man crew, without a Waist Gunner, on missions 338, 339, 340 and other missions following mission 344. Mission 324, 26 February 1945, to Berlin Germany in B-17G 44-8316 (No name) (360BS) PU-P. 2Lt Perkins, on the entire crew's 6th mission, called the Group Leader shortly before reaching the target stating that he had a gasoline shortage and engine problems. On the way to the target the engine on the B-17 was causing problems and began using a lot of fuel. 2Lt Perkins did not believe that he could make the return journey and stated that he was heading for the Russian territory. Upon reaching Russia they found some flat farm country and 2Lt Perkins made a wheels-up landing at Zolotonosha, Russia, near the Poltava Headquarters of the USSAFE Eastern Base Command. 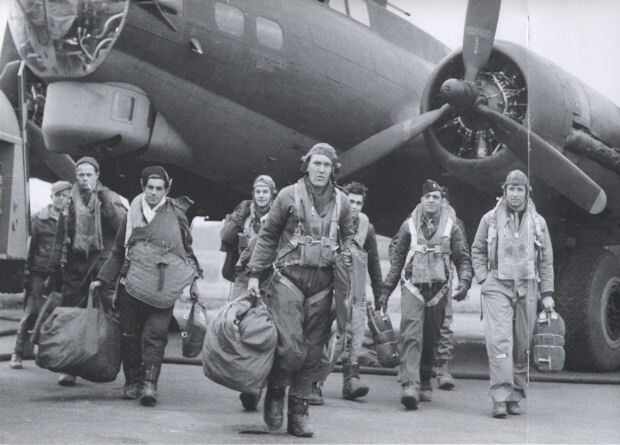 The crew was unhurt and the B-17 was left in Russia and salvaged. The crew returned to Molesworth on 12 March 1945 after some interesting visits in Russia and then via Air Transport Command aircraft with landings and visits in Tehran, Iran, Cairo, Egypt, Tobruck, North Africa. Athens, Greece, Naples, Italy and back to London, England. Combat missions were resumed on 14 March 1945 (Mission 336). On the 26th of February, 1945, we took off on a mission to Berlin to bomb the railroad marshalling yards. Lt. Perkins was the Pilot and I was the Tail Gunner on the crew. On the way to the target we began having trouble with one engine, which began using a lot of fuel. Lt. Perkins did not believe that aircraft, #44-8316 (No Name), could make it back to friendly territory, so just before we dropped our bombs he called the Group Leader and told him we were heading for the Russian lines. We were sort of sweating it out with the Russians, but the weather was so bad we couldn't see a thing so we kept going until we began running out of fuel. We had a great Navigator, Lt. Robert Wallace, who was later to make another crash landing in Germany, flying with a lead crew and was taken prisoner. Lt. Wallace had no maps of that part of the country but he was pretty sure that we were over flat land. No one wanted to bail out so we let down until we broke out of the soup—about 400 feet, and sure enough, we were over real flat farm country. We bellied in on a field covered with snow which enabled us to slide real good and we stopped near a small village with a river. We later found out that the place was Zolotonosha, USSR. The plane was later salvaged. We weren't sure what our reception would be like when the people started heading towards the plane, but as soon as we made them understand that we were American, everything turned out OK.
With the help of a woman who spoke French, we went into the village and got everything sorted out. We ended up splitting up and staying with three or four different families that night. I still to this day don't know what kind of fat meat we ate that night, but we had the same for breakfast the next morning. Later that day we all gathered in the village hall where they gave us a banquet of fried chicken accompanied with a lot of wine and vodka, with which we had to drink one toast after another to Stalin, Roosevelt and Perkins. A couple of the younger guys got sick because their systems weren't used to that sort of thing. That afternoon, they flew us out in five small ski planes. My plane was one passenger open cockpit, so I got down as low as I could to keep warm. The pilot must have thought I fell out because he stood up and looked back and I gave him the thumbs up, to let him know that all was OK. We landed at one of their bases and kept sort of isolated. I ate a lot of spam and eggs while I was there, which was what I believe to be about one week. We had a Russian woman who was a Lieutenant in their Army, as an interpreter. She really wanted my flying boots, so I let her wear them while we were there but I told her I had to have them back when we left. Finally, we were shipped to Poltava, Russia by train. The cars had shelves that pulled down from the walls to sleep on, but as soon as we laid down on them, the lice started to make meals out of us. As soon as we got to Poltava, they had to delouse us and we stayed there for about three or four days. We were flown out by our Air Transport Command. Our first stop was Tehran, Iran, where we stayed overnight. From there on to Cairo, Egypt, where we stayed for two nights and got to see some of the sights.